Perfect for people contemplating a new gas sipping motorcycle in the face of high $3.00+ gas prices or anyone who has too much stuff or too little garage. The Loft-it system is a 1,000 lbs. 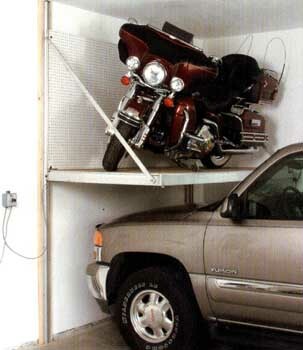 capacity motorized shelf that allows you to make good use of your over hood space. Assuming you have the ceiling height. Americans are notorious for their obsession with cars and increasingly an obsession with their garages. Storage systems like the Loft-it are helping people cram more and more stuff into their garages. As vehicles become more expensive products and environments to store them are becoming more important as well. What will become of the garage as the price of oil drives up not just the cost of gasoline but the cost of the plastic to make all of those storage bins that are used to store so much crap stuff in all those American garages? Will the bicycle rise in place of the car? What about tiny cars? Perhaps their day has come.